Can philosophy really prove the existence of God. Plato and Aristotle believed it could - and did. So did St. Thomas Aquinas. Using logic and reasoning, we can prove there had to be at least one unrestricted, Uncaused Cause – the cause of all reality (we later show why there can only be one uncaused cause). What does it mean to be “unrestricted”? Who created God anyway? It is all here. Watch as Richard Dawkins trips over his own statement and proves God is the MOST likely cause of the universe (guess he never studied philosophy). Learn about the 5 Transcendental desires that point us to God. In the end, we still need faith. We compare the Bible and Science. 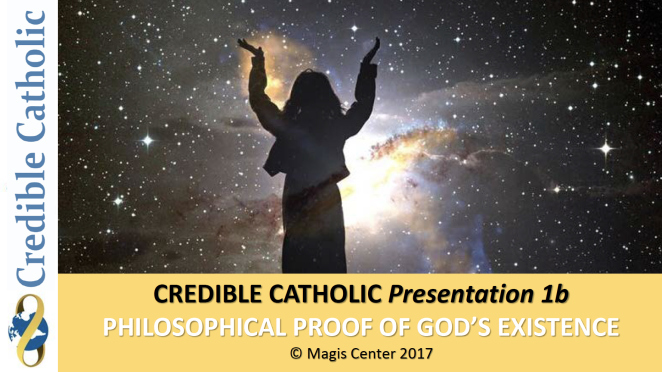 How about evolution – can Catholics believe in evolution? I. How to DOWNLOAD a Slide Presentation: 1) Right-click on the red "DOWNLOAD" button; 2) Select, “Save Target As” or “Save Link As” or "Download Linked File As"; 3) Save the presentation to your Desktop. STOP - For downloaded presentations, you must have Adobe Flash Player and Adobe Reader on your computer for the embedded videos and voiceovers to play properly. These apps are free.